When I was young, I remember my mother buying me the original boxed Dungeons & Dragons set since she had heard it's what 'smart children' played to stay 'creative'. I spent endless hours pouring over the various books and modules absorbing the information. Thoughout my teen years I played with friends until I got to college when going out to parties suddenly seemed like a much better way to spend a Saturday night. Last week I got a Dungeons & Dragons miniature in the mail. There had been a coupon for a free one in PC Gamer magazine and I sent it in. The girls saw it when I opened the box and were interested. I explained about D&D and they were interested. As a result picked up the Basic Set of the game one day at lunch. I had read that the set was designed for kids and first time players. I read the books and info in the boz and it seemed to be perfect. The set includes a set of dice, miniatures for all the characters and monsters, pre-made characters, maps broken up by tiles, and an advanced rules book. The entire first adventure is scripted out and designed to be run my people unfamiliar with D&D if need be. The pre-made character sheets were perfect for handing to the girls to get them started. We played through two rooms in which in the epic battles two kobalds were slain, a locked box was opened, and finally a troglydyte was put to death. The girls loved it. They seemed to enjoy the descriptions of what was happening much more than the dice rolling. When I described the death of one of the kobalds as having it's head chopped off and rolling around the floor, it was bought up shortly thereafter at the dinner table as the girls described their adventure to Michele. 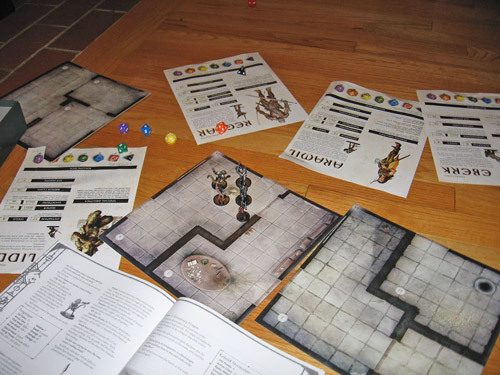 If you want to get started yourself, I recommend the Dungeons & Dragons Basic Game boxed set, it comes with everything you need to get started. I really liked the map tiles that allowed you to plop the tiles down as the adventurers got to that part of the dungeon and didn't require drawing on graph paper. Yes, I know purists will complain, but when the players barely know the dice apart, map tiles are a great idea. The only trouble was when the dog, Piper, stealthily stole the black dragon miniature and chewed on it a bit until Michele saw it. The dragon's wings are a bit gnawed upon, but otherwise we are good. Nooooooooo! How could you do that to your daughters? I think your memory is flawed. You begged for me to buy you the game. I was happy to give it to you. I'd read that it was all about magic and legend. And, I believe in magic. My kids - 14 and 11 - have started to play. I ran them through an adventure last year and they really liked it. Now they have all the new books and are starting to play with their friends. They don't seem to be sticklers for the rules at this point - it's more about the story and the characters. They seem to be having fun and I guess that is what counts. Actually, it isn't about the fun. It's about the phat l3wt!